Usain Bolt celebrated his return to London's Olympic stadium with a convincing victory in the 100 metres at the Sainsbury's Anniversary Games. 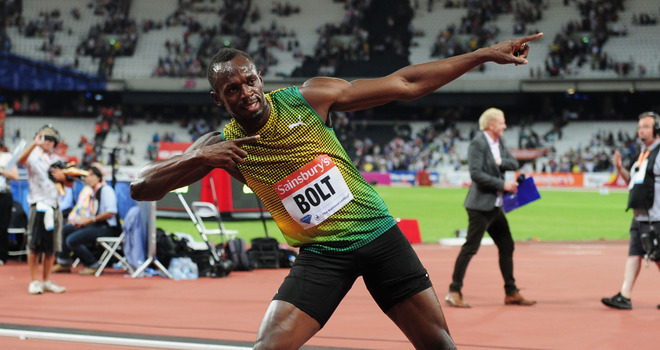 Six-time Olympic champion Usain Bolt produced his season's best to win the 100m on his return to the Olympic Stadium for the Anniversary Games. A year on from the London 2012 opening ceremony, Bolt paid his own homage to last year's Olympics by clinching the blue riband event in 9.85 seconds. Before a sell-out crowd, the Jamaican ran nine hundredths of a second quicker than he had previously done this year. Britain's James Dasaolu pulled out injured before the race. Bolt got off to a lacklustre start, but the Olympic champion overpowered his rivals in the closing stages to dip across the line three hundredths of a second ahead of America's Michael Rodgers in second. Jamaica's Nesta Carter was third in 9.99 while Dwain Chambers, the only Briton remaining in the race following Dasaolu's withdrawal, was fifth in 10.10. Bolt, who will look to regain the world title in Moscow next month, was happy to lap up the adulation from 60,000 fans. "It's so wonderful to compete in London, it's a brilliant experience to be here again," he said. But the world record holder admitted he had work to do ahead of the World Championships. "My start was poor and I need to work on that," he added. "To make a perfect race I need to make a good start and just get into the race. Hopefully I can make a good time at Moscow and continue to do well." The stadium was hosting an evening of athletics for the first time since last summer, when the likes of Bolt, Mo Farah and Jessica Ennis-Hill whipped the crowd into a frenzy during an unforgettable Olympic Games. Much has changed in this corner of east London since that glorious sporting summer. The Olympic Park now resembles a building site, and gone is the Olympic flame, but Friday night's capacity crowd rekindled the spirit of the Games. For all of the nostalgia, however, it was effectively the first night of a two-day Diamond League meeting, and the last track and field event before the World Championships. And for all the Olympic talent on display - 12 gold medallists will compete over the two days - it was Bolt, the world's fastest man, who was the centre of attention on a celebratory evening in the capital. All eyes were on the 26-year-old for many reasons. 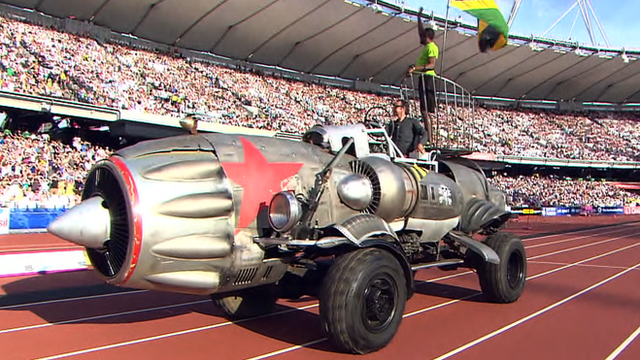 The night began with Bolt being transported into the arena in a gigantic metallic vehicle, described as a "rocket ship". 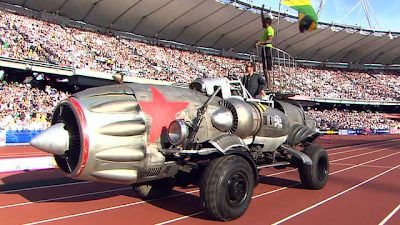 Such is his box-office appeal - and importance to a sport which is in the doldrums because of drug scandals - Bolt now routinely opens Diamond League events by driving onto the track, but seeing the great sprinter in the sort of contraption more normally found in a sci-fi movie was a first. Unsurprisingly, a wall of sound greeted Bolt's arrival, stirring up memories of the thunderous noise which filled the stadium 12 months ago. The 100m and 200m world record holder stood on top of the machine, dancing on the podium and waving his country's flag during the lap of honour, exhibiting the showmanship which has made him one of the world's most recognisable sportsmen. But the crowd saved their loudest cheers for when Bolt brought the curtain down on an uplifting, albeit sentimental, evening.